dear friends: thank you for being so incredibly supportive. you are so amazing. dear sunshine: please come out for me tomorrow! I have to have sunshine to be able to play on the beach tomorrow! dear new job: so far, so good. The first couple days I was so nervous/upset because it is SO MUCH but I am getting the hang of it...I hope. ;) dear Friday night dinners: I'm so happy I can finally be apart of you! (Dinner at V's grandparents!) dear Olympics: I am so sad you are almost over. dear engagement: I want to enjoy you...at least for a little while before craziness of wedding planning comes. dear engagement ring: please finish being re-sized earlier than 3 weeks. my finger is sad. ;) dear wedding planning: I am so excited...and nervous!! for you. dear "person who I thought was my friend": you really hurt me...I share my happiness with you and you do nothing but talk about things you have NO idea about and then call me names. You aren't the person I thought you were. I am so sorry that someone was like that! I hope your job continues to go well and I can't wait to hear about all the wedding plans! Hope you have a great weekend. So many things o be excited about. So sad that a friend can hurt us to deeply and hard. I so relate as I hav recently experinced so sorrow and pain. Hugs to you. Focus on the wonderful events coming up. Have fun in the sun this weekend at the beach. Lovely post! Do you have any ideas on the date yet? Sorry about the "friend" It's sad how often that happens nowadays, people get so wrapped up in themselves they forget to be a good friend and to show appreciation to those who are good to them. So glad the job is good so far! What great letters! Congrats on your new job! Want me to beat someone up for you? :-D ;-) Just kidding! (But seriously.) Text me if you need to talk! Love you! Congrats on the engagement!! I'm so far behind on blog but how exciting!! OMG I totally missed the exciting news! CONGRATS!!! I'm so happy for you both. Oh no! 3 weeks to re-size a ring? I bet you can't wait for it to be finished!! I think mine took about a week and I was about to go crazy! I'm so excited for you... just remember to enjoy every moment. Weddings sometimes bring out the worst in people... especially people who are supposed to be important in your life. Don't let them ruin the moment... this is about you and you need to be surrounded by people who are more than happy to celebrate that! Happy Weekend Friend! 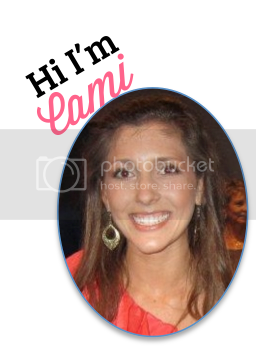 AHHHHHHHHHHHHHHHHHhh CAMI! I missed the engagement news because I've been so behind on blogs this week!!! congrat lovely!! SO excited for you guys!! you have so many good things going on with your life. Congrats with your engagement! I'm sure your wedding planning will run smoothly. Always be happy and stay positive! I hope you are sporting your ring and having a wonderful week! Glad to hear you're getting the hang of it at work. You will be great! I'm so sorry someone hurt you. You don't deserve that. Know that you are beautiful inside and out. It is their loss.